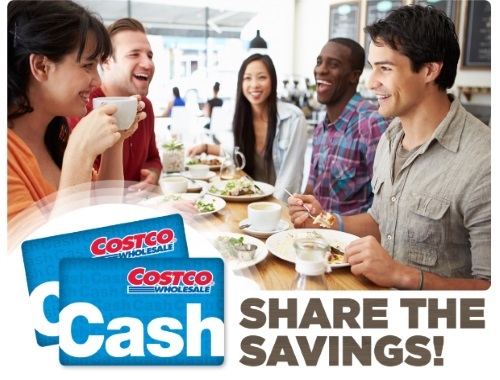 Share the Costco Savings by introducing a friend to Costco and you will both receive a $10 Costco Cash Card! Print the page at the link below and then bring a friend to any Costco Membership Counter in Canada by September 3, 2017. When your friend signs up for a new Costco membership, present the page to the membership clerk and you'll both receive a $10 Costco Cash Card. This offer is for new Costco members or for current members who refer someone to sign up for a new Costco membership. It cannot be combined with any other offer and expires September 3, 2017. A Gold Star Membership is $55 per year (plus applicable taxes) and includes a Free Spouse card. An Executive Membership is $110 per year (plus applicable taxes) and includes a Free Spouse card. A Spouse refers to either a spouse or a family member 18 years of age or older living at the same address.